Salad niçoise (pronounced “nee-swaz,” in my best, butchering attempt at a French accent) is one of those menu items that we tend to skip right over in search of something that sounds a bit more appealing on the plate. The idea of lettuce, potatoes, green beans and tuna served together in the same salad always seemed more odd than appetizing, so we’ve never actually ordered salad niçoise in a restaurant (plus, I like being able to pronounce what I’m about to eat, although I’m also a fan of the point-and-mumble style of advising the wait staff of my selection from the menu. Whatever works.) We decided to try salad niçoise at home because we’re always looking for new fish dishes to try and we found a relatively easy recipe in a Cook’s Illustrated magazine, “Modern Classics.” And cooking a new dish at home, then deciding you don’t really like it is preferable to trying (and paying for) something new at a restaurant and deciding you hate it. Luckily, neither scenario occurred here. We absolutely loved this salad and will add it to our regular rotation. The combination of lettuce, potatoes, green beans and tuna wasn’t strange at all, especially with the addition of hard boiled eggs, Kalamata olives and a tomato-onion mixture. The vinaigrette made with olive oil, lemon juice, Dijon, shallot and fresh basil, thyme and oregano simultaneously brings out the best flavors from the different ingredients and ties them all together beautifully. Salad niçoise is a dish that we will crave from now on, even if I still can’t reliably pronounce or spell it. Bring about half a pound of small red potatoes in a pot of water to a boil, add a couple teaspoons of salt and cook until the potatoes are fork-tender — about 5-8 minutes. Use a slotted spoon to transfer the potatoes to a bowl. Don’t throw out the water, since you will use it to cook the green beans in the same pot. Toss the warm potatoes with a tablespoon of dry vermouth and salt and pepper. 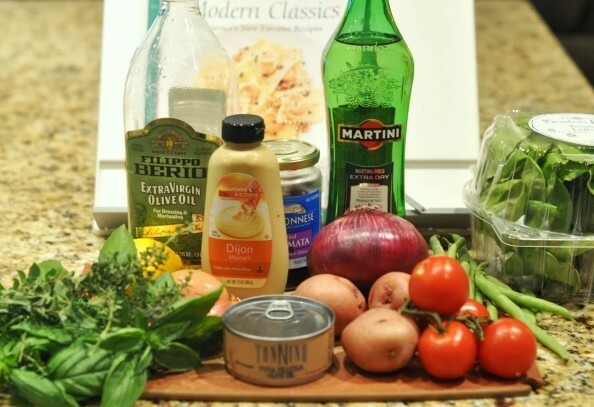 Whisk together the vinaigrette ingredients: 1/4 cup plus 2 tablespoons olive oil; 1/4 cup lemon juice; 1/2 of a shallot, minced; 1/2 teaspoon Dijon mustard; 1 tablespoon finely chopped fresh basil; 2 teaspoons finely chopped fresh thyme; and 1 teaspoon finely chopped fresh oregano. Season with salt and pepper to taste. Toss the potatoes with a couple tablespoons of the vinaigrette and set aside. One of the signature aspects of salad niçoise is that all of the salad ingredients are arranged separately on the bed of lettuce on a platter, rather than tossed together. To make sure the finished salad tastes like a cohesive dish, you’ll be tossing each of the separate salad components in a bit of the vinaigrette before arranging them on the platter. Return the potato water to a boil, add a couple teaspoons of salt and about 4 ounces of green beans (trimmed and cut in half) and cook until the beans are crisp-tender — about 3-5 minutes. Drain the beans and transfer them to a large bowl of ice water to halt the cooking process. After about a minute in the ice bath, transfer the beans to paper towels to dry. Discard the ice water, return the beans to the bowl, and toss with about a tablespoon of vinaigrette and salt & pepper. Drain the tuna and break it up with a fork. Using the right tuna is key to this recipe. Cook’s Illustrated recommends an imported European cut of tuna called “ventresca” that is packed in olive oil (as opposed to water, like the pouches of StarKist “chicken of the sea” tuna used to make mayo-based tuna salads and embarrass reality show stars.) Ventresca is cut from the belly of yellowfin or “bonito del norte” species of tuna. We found it at our local Whole Foods. The can didn’t say “ventresca,” but it did say “yellowfin” and “tuna fillets in olive oil” so we figured that was the same thing. The buttery, yet briny flavor is unlike any other packaged tuna we’ve had. So much so that Dan tasted it and asked what I had done to it, when all I had done so far was drain it. After draining the tuna, toss it with a couple tablespoons of the vinaigrette. Wash and tear up the leaves from a head of Bibb lettuce, toss with vinaigrette to coat, then arrange the lettuce in a layer on a large platter. Imagine a photograph of a bowl containing tomatoes cut into small pieces and thinly sliced red onion tossed with a tablespoon of the vinaigrette and a little salt & pepper. Then begin arranging the salad niçoise. Place the tuna in the center, then add the other ingredients around the outer edges. Place the potatoes, green beans and tomato-onion mixture in their own sections on the platter in whatever order you like. Add a couple of hard-boiled eggs, chopped up and seasoned with salt & pepper and a drizzle of vinaigrette. Then add pitted and halved Kalamata olives (the recipe calls for niçoise olives — hence the name of the salad I suppose — but we’ve never been able to find those in the grocery store so we use Kalamata instead.) You could also add anchovy fillets and/or capers if you’re into those disgusting acquired-taste types of garnishes. Serve the salad family-style, using tongs to portion helpings onto individual plates while feeling all fancy and French. Bon appétit! I’ve always loved your site. Your description of how you came to try, and how you actually prepared salad nicoise is, in my opinion you’re tour de force so far. I laughed out loud at your [elipsed] removal of the au courant capers and anchovies. In my opinion they are way too strong for the salad. I have always loved salad n. Have you noticed that in the last for five years the canned tuna is being replaced by chunks of sesame seared sushi grade Ahi. As is the aura of the salad I love both versions. To me the aura of salad n. Is that wherever I choose to order it I am usually delighted by the vast diversity of its source material and presentation. Your presentation of Cooks recipe does just that. It is the description of the process that made my day – and sent me to the store here in Castle Danger, Minnesota, in search of Kalamata olives and oil packed yellowfin.